Quinoa is a unique grain that has been cultivated in the Andes for centuries. Quinoa is remarkably nutritious and high in protein and was a key part of the pre-Colonial Incan diet. (Read more about quinoa's current global trendiness here). Quinoa can be cooked in water to make a fluffy pilaf. You can also buy quinoa that has been processed into flour (gluten free) or into been processed into flour (gluten free) or into oatmeal-like flakes. This bagel recipe calls for both the cooked grain and the flakes, as well as regular bread flour. Serve these bagels with peanut butter for a super protein-charged breakfast. In the bowl of a large standing mixer, add 4 cups flour, 1 teaspoon of the yeast, and 2 1/4 cups water. Knead with the dough hook on low speed until well mixed. Cover and let this mixture rest overnight at room temperature. Add the quinoa grains to 2 cups water and a pinch of salt. Bring to a simmer, cover, and cook quinoa until it's slightly translucent and water is absorbed, about 15 minutes. Set aside to cool. Add the honey, sugar, and salt to the bowl with the flour/yeast mixture and stir briefly with the dough hook. Add 1 cup of flour, the remaining yeast, 1 cup of the quinoa flakes, and the vegetable shortening. Add the cooked quinoa (reserving 1/4 cup to garnish the tops of the bagels). Continue to knead for about 5 minutes, adding remaining flour 1/2 cup at a time, until you have a smooth, stiff dough. Place dough in an oiled bowl, and let rise in a warm place, covered, for about 1 1/2 hours, or until doubled. (Dough can be left overnight in the refrigerator to rise as well). Punch down the dough and cut into about 12 equal pieces. Roll each piece until a ball and let rest for 5 minutes. Flatten each ball into a rectangle, fold long sides toward center, then roll into a tube. Repeat with remaining pieces. Let dough rest 5 minutes. Use the palms of your hands to roll each tube of dough into a longer tube, until they are about 12 inches long. Let rest again. Bring ends of each tube together, overlapping slightly. Place your hand through the center of the bagel and roll seam gently along the counter to even it out and seal ends together. Fill a large soup pot with water, and add 1 tablespoon baking soda. Bring water to a boil. Preheat oven to 450 degrees. In a small bowl, ix reserved cooked quinoa with 2 tablespoons quinoa flakes and a large pinch of coarse salt - set aside for garnish. Once the water is boiling, add bagels to the water in batches, boiling them for about 30 seconds on each side. Remove bagels with a slotted spoon and place on a dish towel to drain. 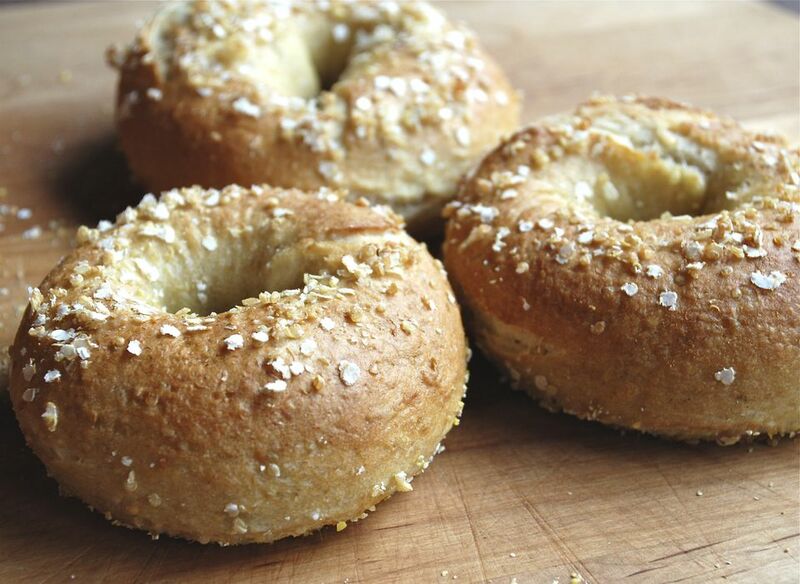 Sprinkle tops of bagels with quinoa grains and salt mixture. Sprinkle a baking sheet with cornmeal and place the boiled bagels onto the sheet. Repeat with remaining bagels. Place bagels into the oven and then turn the temperature down to 400 degrees. Bake until golden brown, about 20-25 minutes. Bagels will keep for one day, then should be stored in the freezer, wrapped in foil.